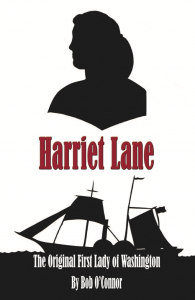 Historical novel about Harriet Lane, who served as First Lady of Washington when her unmarried uncle, James Buchana, was President of the United States. 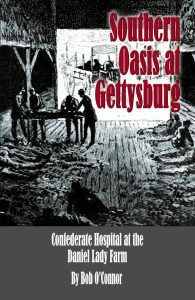 Historical fiction account of the northernmost Confederate hospital in the American Civil War located across the road from Culp’s Hill at the Daniel Lady Farm. War and Civil Rights heritage. 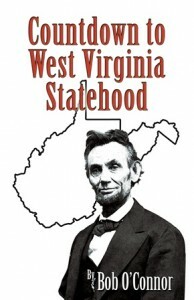 Most people believe that the reason western Virginia split off from eastern Virginia in 1863 was due to the pro-Union people disagreeing with Virginia’s secession in 1861. But the fissure between the two sections actually went back to the first state constitution in 1776. That document called for land ownership as a requirement for voting rights. Many western Virginians were not eligible to vote all the way up to the year 1850. The imbalance caused for much greater representation from the eastern section of the commonwealth of Virginia, and an overwhelming sense from “the mountaineers” that they were being discriminated against. It is often said about the American Civil War that “brothers fought against brothers”. While they did fight on opposite sides, only in rare instances did brothers actually face each other in battle. 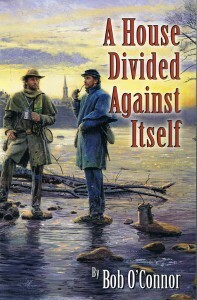 “A House Divided Against Itself” follows two brothers, Wesley and William Culp, who faced each other twice, at the battle of Falling Waters, and at the battle of Second Winchester. And they met again in Gettysburg on the first day of that battle. This interesting tale is based on the regimental records of the two regiments and 90 actual letters of actual instances in the war. Imagine yourself in the early 21st century, finding an unpublished book written by a friend of Abraham Lincoln. That is exactly what happened to nationally recognized author, Bob O’Connor, a member of the Berkeley County Historical Society.O’Connor, who lives in Charles Town, West Virginia, found this rare book in the Lamon papers at The Huntington Library in California in 2008. As editor, O’Connor, transcribed the document and has added footnotes to identify the characters and define the 19th century legal terms used by Mr. Lamon, who was an attorney. Ward Hill Lamon was born in Summit Point, VA (today WV) and grew up in Mill Creek, VA (now Bunker Hill, WV). He moved to Illinois in 1846 and became an attorney on the 8th Judicial Circuit of Illinois. No one had as much access to Abraham Lincoln during his presidency than Ward Hill Lamon. Lamon spent many a night sleeping outside the Lincoln bedroom on the floor to protect his friend from harm. But when the war ended, Abraham Lincoln sent Lamon on assignment and went to the Ford’s Theater against his bodyguard’s advice. The rest is history. It is of interest to note that neither of those two publications was actually written by Mr. Lamon. The first book was written by a ghost writer, Chauncey Black, who was paid by Lamon to write a book based on Lamon’s papers and papers Lamon purchased from William Herndon, another of Lincoln’s law partners. The second book was put together after Lamon’s death by his daughter Dollie from her father’s papers. This book, in fact, is the only book ever written by Lincoln’s bodyguard. 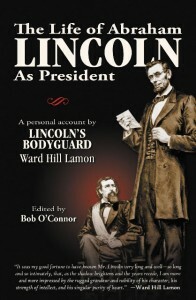 Historians have tagged Lamon as a “braggart” yet those who read this book will find that in every single instance that Lamon talks about himself (as being the “friend who snuck Mr. Lincoln through Baltimore on his way to the Inauguration because plots had been discovered against Lincoln’s life) – Lamon never once identifies that he is talking about himself. 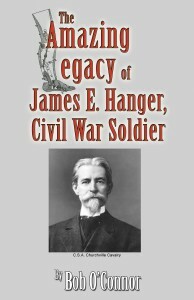 Lamon takes time in his book to talk about the time prior to the Civil War when he says that in the hands of Congress “lay the means of life and the means of death. They gave us one and withheld the other. They declined to take the responsibility of allaying the tumult; but took the far greater responsibility of allowing the nation to drift unconsciously and unprepared into the most gigantic civil war that ever shook the earth…With Congress rested the whole responsibility of peace or war and with them the message was left…but Congress behaved like a body of men who thought that the calamities of the nation were no special business of theirs….It is certain that they did not think the Union in danger or else did not care to preserve it…The nation was going to pieces and Congress left to its fate. The vessel freighted with all the hopes and all the wealth of 30,000,000 people was drifting to her doom and they alone who had the power to control her course refused to lay a finger on her helm.” Ward Hill Lamon was with President Lincoln on a routine basis every single day. He often entertained the President by singing to him and playing his banjo. Those silly songs got Lamon in trouble along the way. Mr. Lamon also traveled with President Lincoln to Sharpsburg in October 1862 and to Gettysburg in 1863. Lemon was asked by Judge Wills to orchestrate the entire event. It was Lamon who was Marshal in Chief of Dedication of the National at Gettysburg on November 19, 1863. Lamon set up the order of procession, invited guest from each of the Northern states, borrowed the buggies and horses for the celebrities, was in charge of security, and introduced Mr. Lincoln as he gave what we now know as “The Gettysburg Address.” In fact, Lamon is the only identified person besides President Lincoln in the one known photograph taken that day. In this book, Mr. Lamon tells of Mr. Lincoln’s daily struggles in talking to widows and women whose husbands were in civil war prisons. He describes Lincoln’s views regarding his family, and especially his young son Tad. Lamon’s friend J. P. Usher and others urged Ward Hill Lamon to write this book. Usher told Mr. Lamon that “there are now but a few left who were intimately acquainted with Mr. Lincoln. I do not call to mind anyone who was so much with him as yourself.” It is not certain why the book was never published until now. 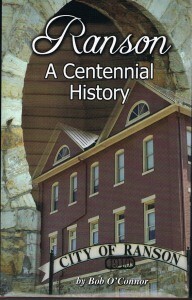 O’Connor has also written a historical fiction account of the life of Ward Hill Lamon, the only account ever written. 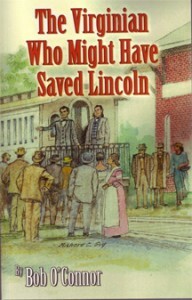 It is called “The Virginian Who Might Have Saved Lincoln” and was published in 2007 by Infinity Publishing. The book is also available as an unabridged audio book. It has been named finalist in both the Best Book Awards and The Indie Excellence Awards. Lamon died in 1893 and is buried in the Gerrardstown (WV) Presbyterian Church cemetery near where he grew up. This 233 page, hard bound book follows the history of a West Virginia town that was the first planned community in the region. The town’s streets and plats were laid out in 1891 by the Charles Town Mining, Manufacturing and Improvement Company. The company’s office building still operates today as the Town Hall, seat of the town’s government. Along the way, the town has attracted more than its fair share of heavy industry. Some of those buildings are in adaptive reuse 120 years later. This non-fiction story is of the town, its people, and its unique tales. Although probably like a lot of other small towns in America, Ranson’s place in history is unique. The U.S. 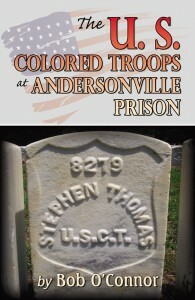 Colored Troops at Andersonville Prison”, unlike my other three books, is non-fiction. It is the account of the 103 black soldiers at the prison and a biography of each. 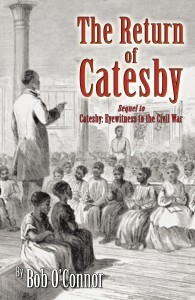 It is a follow-up from my last book, “Catesby: Eyewitness to the Civil War” as Catesby was in that prison and kept records of the black soldiers in there with him.This book includes a photograph of the grave marker for each USCT soldier who died in the prison except one, as he has an unmarked grave. Of the 179,000 black Union soldiers, only 776 ever made it into a Confederate prison. We are even unsure of the accuracy of that number, because several may have been counted more than once as they were moved from one prison to another. Learn about the experiences of a real slave who was captured by John Brown during the famous raid at Harpers Ferry in 1859. The book follows Catesby’s life after the raid and his determined quest to become a free black man.During his journey, Catesby encounters abuse, terrible conflicts, trusted friendships and love, as the war seems to follow him from place to place. A skilled blacksmith and an educated man, Catesby becomes the “inside source” to describe events you could not even imagine. You will find his story unforgettable, but also very believable. President Lincoln’s trusted friend, former law partner and heavily armed bodyguard, Ward Hill Lamon, is the subject of this new historical novel. Lamon snuck Lincoln into Washington prior to the Inauguration when detective Allan Pinkerton uncovered a plot to assassinate Lincoln when his train passed through Baltimore. Lamon was in charge of the dedication of the national cemetery at Gettysburg on November 19, 1863. Many nights he slept on the floor outside the Lincoln bedroom in the White House to protect the president. But he was not at Ford’s Theater on April 14, 1865 when the president was shot. See the Lincoln Bodyguard blog by Bob O’Connor for a peek into what Lamon might have had to say about his life with Lincoln. And for more information click here. 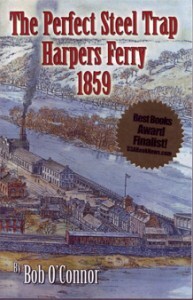 The Perfect Steel Trap Harpers Ferry 1859 is a historical novel surrounding the John Brown raid, trial and execution in Harpers Ferry and Charlestown, Virginia in 1859. The four hundred-page book is narrated by Owen Brown, one of John Brown’s sons, who escaped from Harpers Ferry and lived until 1889. He and another raider, Osborne Anderson, supposedly gathered the information for this book from participants in the events to get for themselves answers regarding what happened. All characters in this book are real and were really at the scene. They provide about two dozen eyewitness accounts provided through their unedited reports. Photographs and drawings accompany the text. You will meet famous persons who were on the scene, like Brevet Colonel Robert E. Lee, Jeb Stuart, Governor Henry Wise, and Thomas Jackson (later to be known as “Stonewall”). And you will meet just ordinary citizens like Margarette Brown and Christine Fouke. Along the way you will be taken on the harrowing escape of seven of the raiders, along the ridge of South Mountain to points north, as they were pursued by men and their dogs. The large bounty placed on their heads being the prize everyone was seeking. Two were eventually recaptured, but five escaped and were never found. 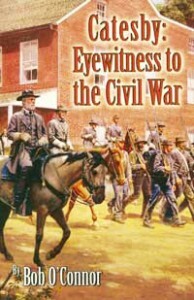 You will learn about the raid, the trial and the execution, from accounts of A. J. Phelps the conductor of the B & O Railroad, Judge Parker the trial judge, and David Hunter Strother, Harpers Weekly journalist and artist. And you will meet highly unlikely participants, like J. B. Wilkes, an actor: Samuel F. B. Morse, inventor; and Josiah Perham, railroad entrepreneur. The Perfect Steel Trap Harpers Ferry 1859 is based on fact. Newspaper accounts, telegrams and court documents included in the book will tell you what really happened during these exciting times. Frederick Douglass, who told John Brown that Harpers Ferry was “the perfect steel trap”, provides the title of this book. 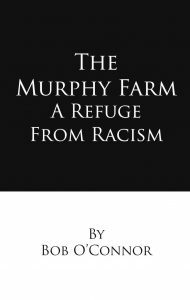 Douglass told him, once Brown and his men got in, the trap would close and all would be lost. 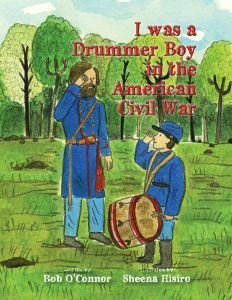 My new children’s book is about the nephew of my great uncle who marched with the 105th Illinois during the American Civil War. The book is expertly illustrated by Sheena Hisiro. The book details the importance of the regimental drummer boy and covers details of hisadventure. 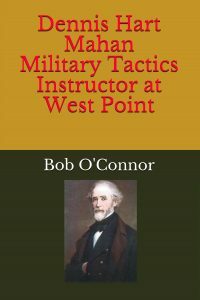 The story of the academy proessor who taught military tactics to over 900 West Point graduates who ofought in the Civil War, including over 450 generals from both sides.